I have teamed up with the very lovely Florist, Victoria Clarke of FoxGlovesandGlory to bring you an evening of festive fun! Victoria and myself will be hosting a Christmas Wreath Making Workshop at The Framers Studio in Tufnell Park. Bronwen Whitaker recently opened her Framing studio and shop on Campdale Road, Tufnell Park. After a visit to her store to arrange a print to be framed, we soon chatted about business and exchanged ideas for future collaborations. Bronwen is really enthusiastic about all things creative and hopes to hold many different evening workshops in her shop. So... here we are…We are the first of many to open the doors of Bronwen's shop for an evening workshop. What a great time too, to embrace the festive season with a wreath making theme! Please do get in touch if you would like to know more about the workshop or if you would like to book up! Reserve your place quickly as seats are going fast! Its always a pleasure to work with Kate Halfpenny. Her dresses are truly beautiful pieces. Everytime I visit her boutique, I want to get married all over again! The flowers I chose for this shoot included, anemones, ranunculas, lilac, hellebores, jasmine and astrantia. For the dark pink bouquet, I used Pink piano roses, anemones, clematis and a little foliage. The contrast of the cream and the almost black purple anemones looked really stunning. For the full feature of this gorgeous event for Zander's baby shower, click here. Together with www.whitedoorevents.co.uk and www.villadolce.co.uk, Victoria Flowers transformed the venue for a magical garden party to celebrate the arrival of a beautiful baby boy! I loved working on this wedding. The Bride and Groom were delightful to work with and incredibly passionate about flowers. They specifically chose a spring wedding to incorporate all their favourite flowers. Cherry blossom, English Lilac, Muscari, Sweet peas, Ranunculas to Geldarose.… every florists favourite flowers incorporated in one special event. 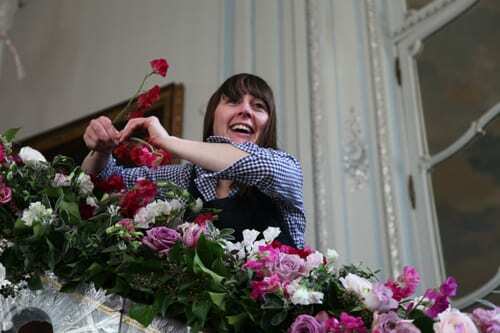 It’s Florist Friday and today I’m thrilled to feature an interview with Victoria Lemmon of Victoria Flowers. 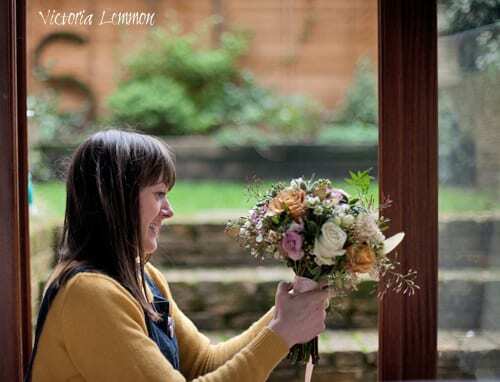 I first came across her breath-taking work when I was searching for a video for a Flowerona Links post and just had to get in contact, as I was totally captivated by her wedding flower designs! Having three big brothers, I’ve always been a bit of a tomboy. I love getting my hands dirty and being outside. My twin brother and I were always running around in the fields back home, plucking up onions, picking berries, eating them and going home with bellyache! With a love of the outdoors, the countryside and of course the beauty of flowers, I always hoped to have my own flower shop. My life when I left home in Kent took a different path as I studied Fashion Management in Nottingham and moved to London to pursue a long career for a leading menswear brand in Product Development and Production. I still had this burning desire to work as a florist, to be more creative and run my own business, so I started to research more about the floristry industry and courses available to set about my new direction. It was a massive leap of faith in so many ways, financially, physically and emotionally, but one I have never ever regretted. I started my journey seven years ago now, taking a course at one of London’s prestigious flower schools. Initially starting out at Jamie Aston’s flower shop in Marylebone, I then moved to Moyses Stevens, working and managing their Knightsbridge store for over two years. When a position arose to work on the Events team at McQueens in Clerkenwell, I jumped at the opportunity to gain a greater insight of this side of the industry. I loved working on the Events team where I could deliver to the clients brief and see all the amazing venues not only in London, but across the country and Europe. I worked at McQueens for over three years before I set up Victoria Flowers. Victoria Flowers has grown steadily from strength to strength, mainly built on recommendations and word of mouth. One wedding or event has led to another through positive feedback. I’ve also been involved in fashion and bridal shoots, which has been a great platform to push the boundaries of what Victoria Flowers can do, as well as working with some very talented people. I started my business in the spring of 2012. I had the opportunity to take on a very large wedding that year and decided it was the perfect time to go it alone. I’m based in North London, just outside Camden. I work from home in our dining area, garden and terrace. Quite often, flowers are lined up in our daughter’s bedroom and she will talk to them if they need to open before the big event!! We plan to move in the coming months. So I will have my own studio to work from and I hope to have enough space to open a flower school. I love to invite clients to visit me at home as they can get a feel for my style and view the vast range of vases I’ve collected over the years. I love to collect vintage vessels from antiques markets, boot fairs and even charity shops. They’re all so individual and unique. I’m not restricted however as I also hire in vases, depending on my clients’ requirements. I offer a truly personal service for bespoke event floristry. I mainly work on weddings but all types of events…corporate, private functions and bat/bar-mitzvahs. I love visiting New Covent Garden Flower Market where I’m always inspired by all the flowers, colours, new varieties and changing seasons. I’m totally overly excited by foliage too. I often take an early morning drive over there just to see what’s around and get home before my husband and daughter have even woken up! Colour is often the basis of my inspiration for my work. Working closely with the client to determine the palette will set the scene for the design. My clients inspire and excite me to fulfil their dream arrangement. Walking, travelling, visiting galleries and shopping are things I love to do in my free time and there are always inspiring things to find, from the Italian foliage on our summer holidays in Puglia, shop window displays around London, art in the Tate Britain or just a stroll through Hampstead Heath. I’ll always pick up an idea or two for future work. The internet is also great for inspiration, especially Pinterest and Instagram. Clients often come along to consultations with images downloaded for initial ideas to discuss together. It’s a great starting point. If I’m to describe my style, it’s natural, informal and abundant. I always work within the season and love to use a mixture of different foliage with every design, to give movement and texture. I have many bookings for this year through to September, so I’d love to see more for the tail end of 2014! I would also like to start planning a flower school once we move, but I’ll hold fire until later in the year or 2015! Thank you so much to Victoria for all her help in compiling today’s blog post. To see more of her stunning work, please visit the Victoria Flowers website. Check out Period Living this month as I feature in the 'my vintage world' section on the back page! Heres a few more images that didn't make it into the feature of the collectible vessels I have available for your wedding flowers! From hessian potato sacs, vintage tins, old medicine bottles, cut glass decanters, silver sugar bowls and large amber and green jars. Contact me on 07973 391787 if you would like to arrange a visit or meet me to discuss your future wedding requirements! Victoria Flowers displayed cake stand arrangements at a showcase event last Thursday evening at the gorgeous Kenwood House venue. Kenwood House is one of London's most famous historic houses. It is set on Hampstead Heath, with stunning views over the iconic London skyline, an elegant Robert Adam designed villa which is home to some of the finest artworks by Rembrandt, Vermeer, Turner and Gainsborough. From the opulence of the main house to the comfort of The Old Kitchen and The Brew House in the service wing, it’s the perfect setting for any celebration, offering facilities from 20 to 120 guests seated and 180 standing. Kenwood House has recently re-opened after a huge restoration program and now holds a wedding licence where couples can marry in the main Orangery overlooking the Heath. Victoria Flowers has been selected as one of the preferred suppliers for this prestigous venue. If you are looking to book your wedding here or have indeed already booked, I would love to hear from you to assist with your floral requirements. Clara and Jason chose the utterly gorgeous Wilton's music hall in East London for their wedding day. With both the ceremony and reception held in the main concert hall. This venue really is London's best kept secret! It is the worlds oldest surviving Grand music hall and a stunning venue for a wedding celebration. Clara and Jason chose an eclectic mix of cream, pinks, orange and golds for their winter wedding. The flowers included blowsy combo,naomi, memory lane and quick sand roses, ranunculus, freesia,wax flower and plenty of gold berried eucalyptus. The ceremony flowers included posies tied on chair ends to highlight the aisle, long arrangements along the main stage and a huge ornate urn with lush seasonal blooms and plenty of draping ivy and jasmine. The tables centres sparkled with a grouping of cut glass vases and tea lights placed onto mirrored discs. 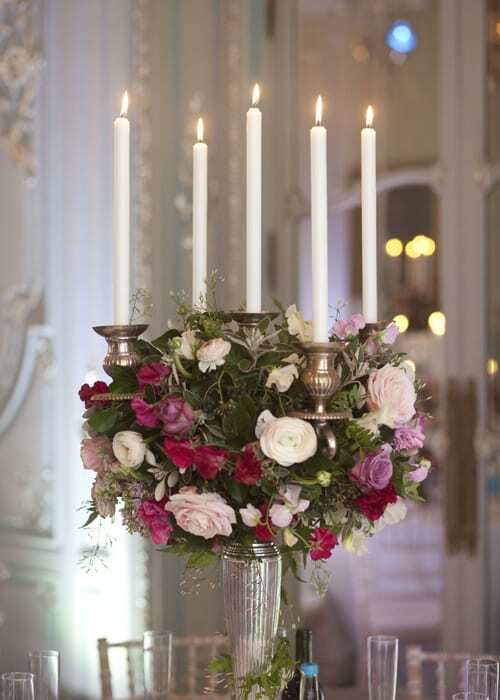 The flowers were loosely arranged into the vases to create a very natural, unstructured feel. The cake was dressed with the most delightful bride and groom figures… Check out the photo. One of the brides friends made the rabbit and fox by hand. The bride was even holding the tiniest bunch of flowers. So pretty! Here are just a few of my iPhone shots on the run, taken between set up! Made from scratch using a local tree surgeons unwanted cherry branches, I created the base of a giant heart wreath. The bare heart was then covered in pine and mistletoe. The pine cones and fairy lights were the finishing touches to this festive LOVE HEART!! The giant wreath was hung in the window of Kate Halfpenny's gorgeous Woburn walk boutique with candles and a garland to finish the decoration and of course a door wreath to match…. 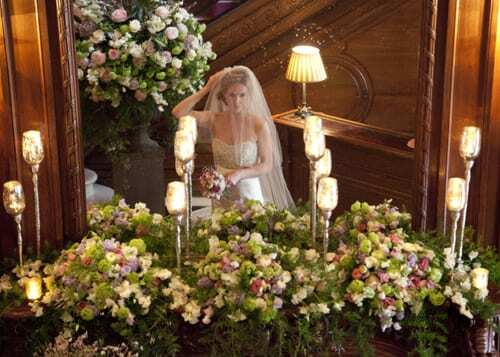 With Kate's beautiful bridal gowns either side, the window looked simply stunning!.. HRH The Princess Royal, has attended a reception in central London to celebrate the merger of two charities that support people with learning disabilities. The reception, held at The Honourable Society of Gray's Inn, was attended by around 60 people including staff, trustees and supporters of Hft. It was a chance to celebrate and thank guests for their continued support. HRH Princess Alexandra, who was Self Unlimited’s Royal Patron, was also in attendance. The Princess was thanked for more than 30 years of dedicated service to Self Unlimited and was presented with a bouquet of flowers. HRH The Princess Royal was also in attendance. I was recently given a brief to make up a bridal headdress to fit a beach style wedding with a relaxed, laid back feel. I chose to use dendrobium orchids, stephanotis for the trails on the headdress, white thistle and a little white phlox. The effect was delicate and flowing. I look forward to seeing the piece in the magazine soon. Take a look at this week's Hello magazine (21st Oct issue no. 1299) Page 121 features a bridal bouquet by Victoria Flowers. I am thrilled to have my work feauterd next to London's prestigious Wild at Heart. 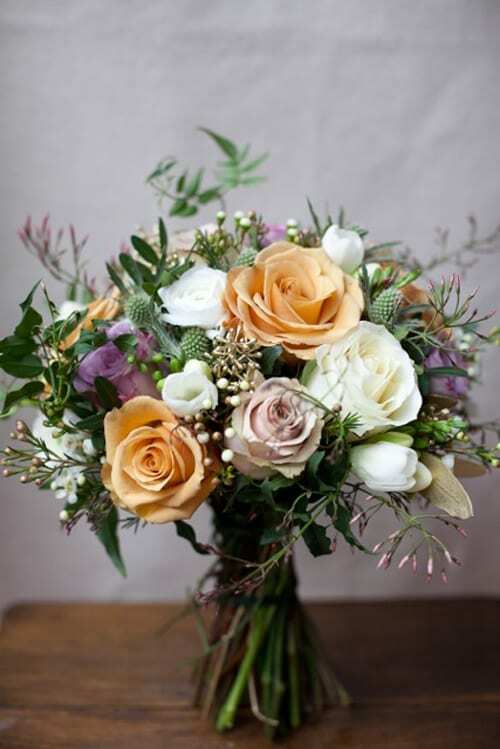 The bouquet was made up of heavenly scented English garden roses from London's new covent garden market, beautifully blowsy English Lisianthus in sorbet tones of pinks and peaches with a few white snowberries to bring in the change of seasons. The bouquet was tied off with vintage lace and pearl pins. I had the pleasure of making up some bridal bouquets and head dresses for the UK's no.1 Bridal magazine BRIDES recently. Victoria Flowers features in the November/December issue out now. The brief was a reds/pinks bouquet in the style of Natalie Portman's ethereal vintage look to include a simple, understated head dress. The second brief was to fit Kiera Knightley's low key wedding style. Stunning decoration for any event. Bespoke letters for your wedding day, numbers for a birthday party or cheeky words that have a special meaning for your occasion. These made to order letters are a fun addition to your event. They can be covered in foliage, moss or flowers and look great with fairy lights too. Hung against a wall or placed on the ground and available in any desired size. Please do contact me if you would like further details or pricing. Victoria Flowers donated jam jars of summer English dahlia and lisianthus in aid of Macmillian Charity for a coffee morning at Kate Halfpenny's London boutique. These delightful arrangements were made up for a boy's baby shower. I used soft tones of blues, whites and creams. Hyndrangea, campanula, jasmine, roses, lisianthus, gypsophilia and phlox. The start of the summer was an exciting occasion for our household with our own wedding. With a little help from some gorgeous flowery friends and even a visit all the way from Seoul/Korea, by Jojo, the owner of www.inspired-byjojo.com, our flowers looked perfect for our special day. I chose summer flowers in whites and creams with hints of yellow to fit with our 'lemmon' theme. 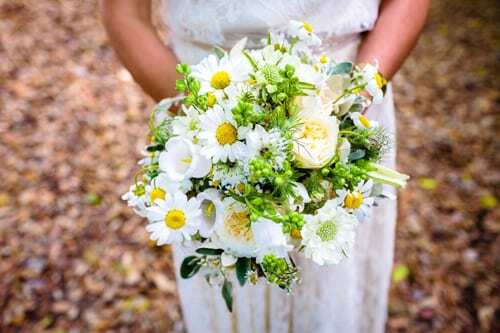 Marguerites, Camomile daisies, David Austin Roses, English garden roses, Scabious, Larkspur and Campanula were the summer flowers of choice. The entrance to the church and reception were decorated with lush garlands of mixed seasonal foliage and plenty of lemons! 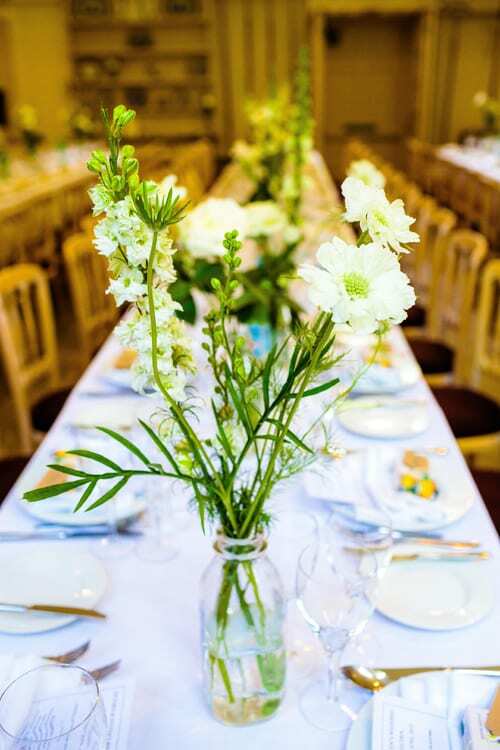 The tables and dressers in the Old Kitchen venue at Kenwood House were decorated with vintage milk bottles, jam jars and medicine bottles, filled with loose stems of flowers. A perfectly lush and informal look to suit the day. Check out the Boho Weddings Blog for more of our wedding pictures as we were recently featured in Boho weddings Blog. These pictures show a taste of the flowers I made up last week for HalfpennyLondon's new collection photoshoot. I am so pleased to be working with this amazingly talented designer. Kate's dresses are dreamy, British made, vintage inspired, adorned with french laces and hand beading, they are simply stunning timeless pieces. The shoot went really well and and the flowers opened perfectly for these dramatically oversized headdresses. Last week I was asked to make up some flowers for a showcase event at The Hawksmoor Steakhouse restaurant in Guildhall. After setting up party flowers there earlier in the year, I was kindly chosen as a preferred supplier for future events at the venue. The restaurant is a perfect place for a city wedding reception with ample space for drinks and canapes, followed by a meat filled feast in the restaurant until 2am. The venue is very cool with dark wood panelling, leather chairs and gorgeous herringbone floors. I'm yet to try the food but its on my list of 'must do's' this year! The flowers were set up for a long table of 25 guests using old cut glass dishes and bottles. Each vessel filled with white and green flowers with a hint of dusty pink. Dahlias, Peonies, Nigella,Tulips and sweet avalanche roses. Senecio and Spirea were used to add texture. This combination was beautiful and worked perfectly against the dark wood interior. Unfortunately I didn't take my camera on site to show the set up! But this was a snap of them ready to go out the door! A perfect week to spend outdoors working on an installation for a fishing shed. A transformation using trees, shrubs and bedding plants with a collection of old pots, galvanised containers and baskets to bring this rustic shed to life. Cant wait to see it in a few months once the flowering plants have taken shape. Alongside some of London's most prestigious florists... Victoria Flowers has had its first exposure! Thank you so much to Eleonore Crompton @themumdaytimes and especially to Kate @halfpennyLondon. The selected bouquet was a modern, beach style number in whites and greens. I chose to use Eucharis lilies and Calla Lilies with flashes of asparagus fern and bear grass.